Hewitt first brought international awareness to the Bahamian Brewery and Beverage brands by donning T-shirts with the Strong Back logo at the 2012 Australian open press conference. This year, he also wore the Sands logo on the court, at the most prestigious tennis arena in the world – Wimbledon. 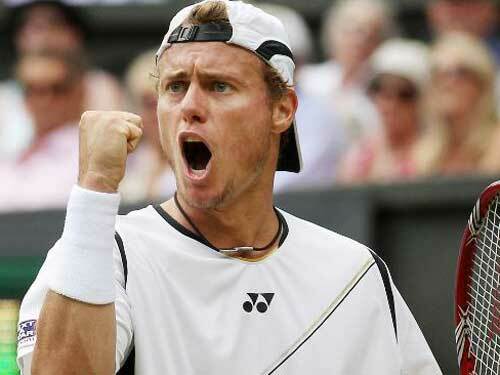 Hewitt defeated Stan Warinka of Switzerland to make it to the second round of Wimbledon; unfortunately, he didnâ t advance any further. His performance, however, not only gained widespread recognition for Sands Beer, but also displayed that he is still a contender in the tennis world. Sands, and the Brewery are excited to see how he will do in the upcoming U.S. Open. The Brewery is a proud supporter of sports in the country, mainly focusing on the sport of sailing. The Brewery sponsors numerous sailing competitions throughout the country, including bringing back the art of sculling. Sands will host its next sculling competition coming up in West End on August 24. The Brewery is very aware of the benefit of all sports and is extremely pleased to be advertised in the tennis arena by Hewitt, who has been a Bahamian resident since 2009.